India will launch the PSLV-C45 on March 21 which will put 30 satellites, including one for electronic intelligence, in three different orbits. Speaking to ANI, Indian Space Research Organisation (ISRO) Chairman K Sivan said, "On March 21 we will have PSLV-C45 launch. It is going to launch an electronic intelligence satellite, along with 29 customer satellites from other countries. 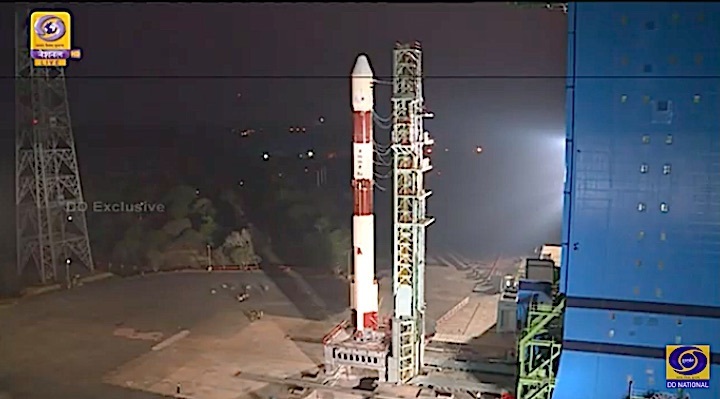 The speciality of this mission is that for the first time PSLV will launch satellites in 3 different orbits." Sivan also said that ISRO is planning to launch India's second moon mission Chandrayaan-2 by April end. He also spoke about the Small Satellite Launch Vehicle (SSLV), which is scheduled to launch two 'strategic purpose' satellites in July-August this year. "SSLV is a small satellite launcher. The first launch will take place in July-August where two small satellites will be launched. They are for a strategic purpose and will be used for monitoring and mapping," he said. "Very soon we are going to make PSLVs from industry for which L and T and HAL have formed a consortium. Along with that small satellite launch vehicles will also be made by the industry," Sivan added. On February, 19 the Union Cabinet chaired by Prime Minister Narendra Modi had given its approval to the setting up of a new company under Department of Space (DoS) to commercially exploit the research and development work carried out by ISRO.